Even more NEW umbrellas for you. Two more brand new umbrellas for you from Umbrella Heaven. 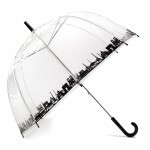 Vision Clear Dome Umbrellas – Featuring the London Skyline & Paris Skyline detail, in black, around the hem of the big, clear, dome shaped canopy Unfortunately we no longer stock this umbrella. Click here to check out our range of quality clear dome umbrellas! Automatic opening mechanism. Polished steel shaft and top. Steel frame with eight fibreglass ribs. Faux white stitched leather PU crook handle. Pongee polyester fabric canopy. Large white frill (approx 10cm (4″) around the hem of the white canopy. Canopy Span 100cm (39½”). Overall Length 88cm (34½”). Click here to check out this unique umbrella! Your Last New Umbrella For This Week… The Burlesque Ruffle – Red Rose. Have A Good Weekend! 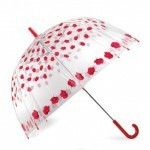 Ladies Burlesque Ruffle Umbrella – Red Rose Unfortunately we no longer stock this umbrella. 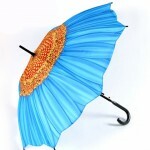 Click here to check out a similar umbrella! 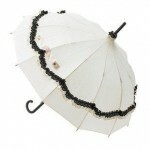 Coming Soon… The extremely lush Cream & Black Lace “Faith” Umbrella by Lisbeth Dahl. Unfortunately we no longer stock this product. 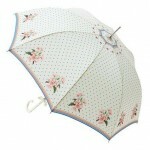 Click here to browse our range of unique umbrellas! The Red WarwickBrand new, Warwick Windproof Walking Umbrella. Good quality, strong, great value. Eight colours. Like what you see? Click here to view this unique umbrella! 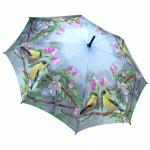 Goldfinches Umbrella… Another NEW umbrella, featuring lovely artwork from one of the premier wildlife artists of our time, James Hautman. Click here to check out our range of quality umbrellas! Clear Dome Umbrella – Tartan The latest addition to our range is this Clear Dome Umbrella with a broad tartan trim around the canopy. Perfect for our friends north of the border. Unfortunately we no longer stock this product. Click here to browse our range of clear dome umbrellas!